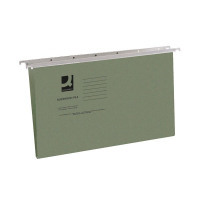 These Q-Connect Foolscap Tabbed Suspension Files are ideal for economical filing. Pre-punched for 2-piece filing clips and made from attractive and durable green manilla, these files are a great option for filing at home or in the office. These files are foolscap size (388m wide, 240mm deep) to fit a wide range of files and cabinets. Supplied complete with snap on tabs and white inserts for labelling, this pack contains 50 suspension files.